It is already Thursday tomorrow? Now way! Today it was such a "almost too social" day, I couldn't get to work. I kept on meeting some of the new colleagues, talking about this and that and the day was gone! Tomorrow I will put on my most unfriendly face to avoid that! 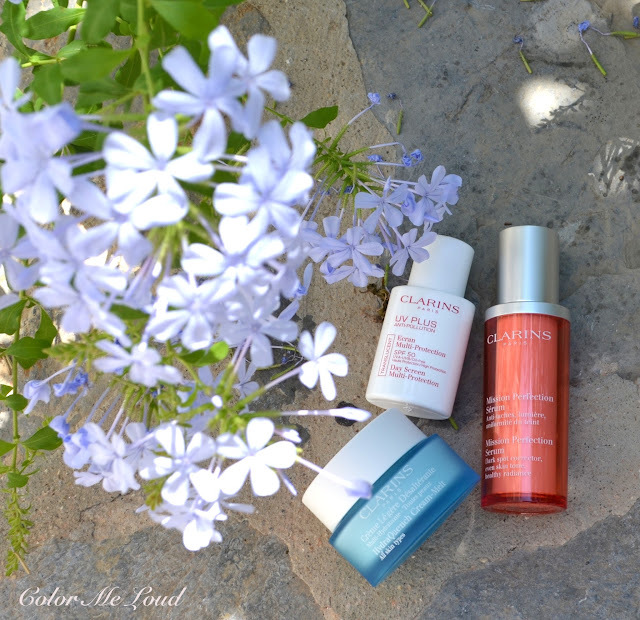 I have been testing some Clarins skincare products lately. Today I would like to show you three of which I have been loving. I took these products with me on holidays and I am tested throughly. To the point that I thought I should write a review before I finished the product. Here are my thoughts on Clarins HydraQuench Cream-Melt, Mission Perfection Serum & UV-Plus Day Screen Multi Protection. Clarins HydraQuench Cream-Melt (aka Crème Légère Désalterante) is an interesting product which is defined as "a fine melting cream specially formulated to deliver softness and radiance to Asian Skin" on the box. Directly under it there is a German translation which doesn't mention "Asian Skin" bits. I really don't care too much about the claims of the products so I doesn't really matter that I am not that Asian after all but I have been enjoying HydraQuench Cream-Melt so much that it is on my rebuy list already. Now if you are dryish like me, you can understand my problem. During Summer my skin is not all that dry but somewhat dry especially after going to the beach, swimming, or simply after cleaning it. I need to moisturize it but I need a very light weight moisturizer which hydrates and soothes. A few of them I tried were awful right after I started sweating to the point that I need to get most of it off with a tissue or cotton pad. Clarins HydraQuench Cream-Melt is very light weight while still being effective. It is absorbed very quickly, leaving the skin hydrated but not oily. It has a slight cooling effect too which is great during Summer. Until now the only moisturizer I could wear above 30 °C. I also enjoy it for speedy hydration, in between, such as right after the cleansing my face when I come home because I have my night routine but it is too early for that so I just pop a bit of this one until then so that my skin feels soft and hydrated. It contains 50 ml of product and costs around 43€. Mission Perfection Sérum is a whitening serum against pigmentation and discoloration and dark spots. I have started testing it recently since I didn't want to apply it on holiday when there was way too much sun. All I can report about at the moment is that it doesn't dry out the skin like some other whitening products does and it applies nicely. I will keep on applying it and let you know how it goes with my dark spots. It is very exciting too because Clarins claims that they have made a breakthrough discovery concerning the role of cell messengers. Mission Perfection Serum has 30 ml of product and costs around 70€. 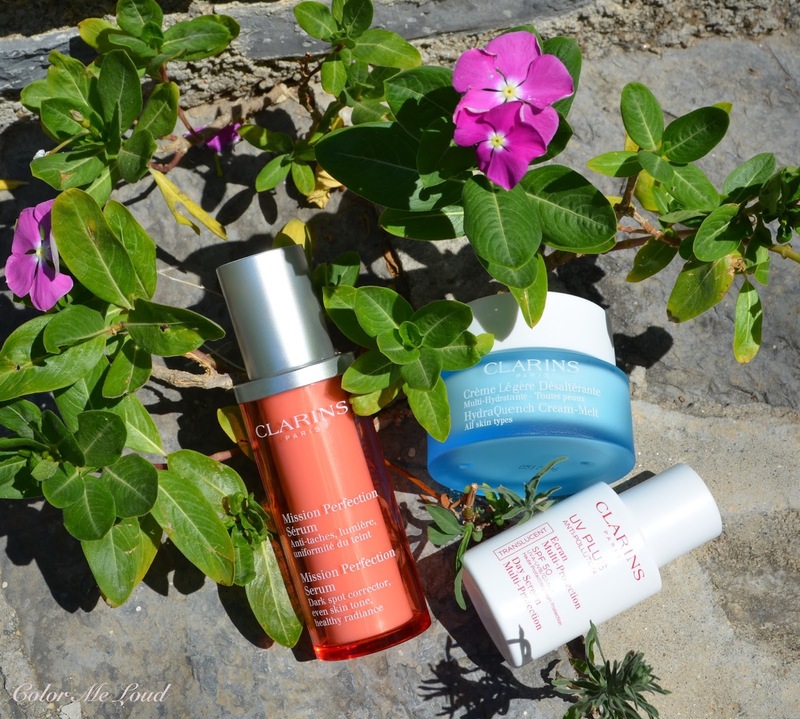 Clarins UV-Plus Day Screen Multi Protection was my choice of sunscreen for the holidays. When I am working, I prefer something lightweight, like Darphin one (reviewed here) that I enjoy under my make-up. When I am outdoors more a longer time, such as on the weekends, or when I am at the beach then I need more protection. Clarins UV-Plus Day Screen Multi Protection blocks both UVA-UVB and it is oil free. The active ingredient is Titanium Dioxide which provides mineral (physical) sunscreen. As you can imagine this gives the face a white cast but since the ingredients are at nano level, it doesn't look half as bad as some I have tried. I have already written that last year some of the neighbors asked if I was ill and why I was looking so white. This sunscreen has passed the neighbor test and this year passed without a single question. It also has Methylene Bis-Benzotriazolyl Tetramethylbutylphenol at nano level for an additional chemical protection. Other notes, it distributes nicely if you give it a good shake, it also stays put and doesn't look patchy or strange when it comes in contact with the water (sweating or swimming are fine). Thumbs up! UV-Plus contains 30 ml of product and costs around 38€. Have you tried any of these? Any recommendations of hydrating skin when it is way too hot and humid? I actually really like the sunscreen! I think it's part physical part chemical, but I could be wrong. The Darphin one is just too scented so I've actually never tried it on my face! you are right, I missed Methylene Bis-Benzotriazolyl Tetramethylbutylphenol when I was checking, which is chemical and again nano in there. Darphin one is amazing, love how it hydrates my skin, use it daily. I do believe that Methylene Bis-Benzotriazolyl Tetramethylbutylphenol is the key ingredient in de la Roche Posay Anthelios which is one of the sunscreens I stockpile when I visit Europe (even though, sigh, it contains alcohol, which otherwise I totally avoid). That being said, I personally am always a bit concerned by nano-ingredients because they enter the body more readily and as a science type, I am not convinced that they have been studied enough. As a fair type, I can tolerate the white cast in physical sunscreens, which usually does disappear eventually. Choices, choices. I think I am going to have to give Clarins SPF a go this Summer. I have been using Shiseido for a long time but recently fell in love with the Radical one, but wow, this is a seriously pricey sunscreen. 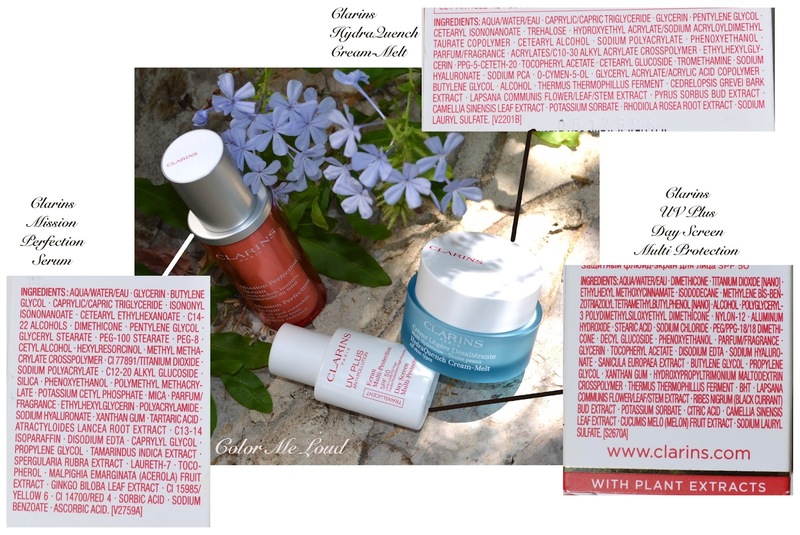 Clarins is much more affordable and great quality!